Wobbleland is days away and PRIME can barely contain its excitement. Spanning two venues on the same day, Vital, Lights All Night and PRIME have curated the wobbliest bass lineup to hit Texas. 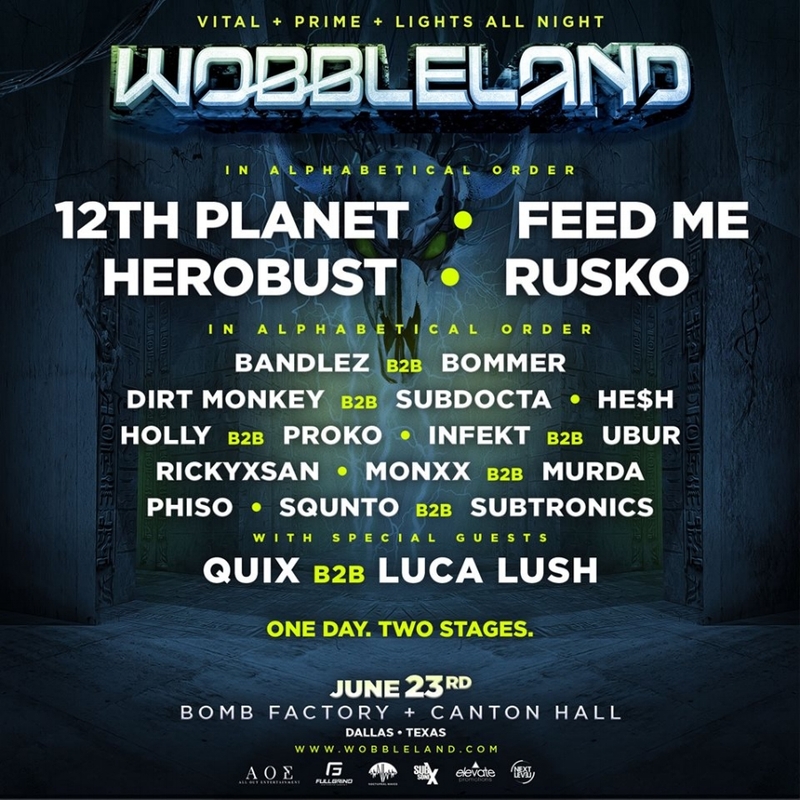 Check out Wobbleland Dallas stage lineup below. Both the Toxic and Main stage are stacked from start to finish, featuring a lineup you've only dreamed about. Are you going to start your evening with Dallas native He$h or with insane Holly and Proko B2B? What about the rare B2B between Luca Lush and QUIX or a just as rare Dirt Monkey B2B Subdocta at 8pm? Rickyxsan or 12th Planet? Who are you going to see? It wouldn't be a true festival without the accompanying pre-party and you know we have you covered. Invading Deep Ellum Art Company on Friday, The Widdler, Big Chocolate and more will set speakers ablaze on Friday, preparing our bodies for the massive that Wobbleland promises to be. Tickets are still available for this, so get them now and don't miss out! 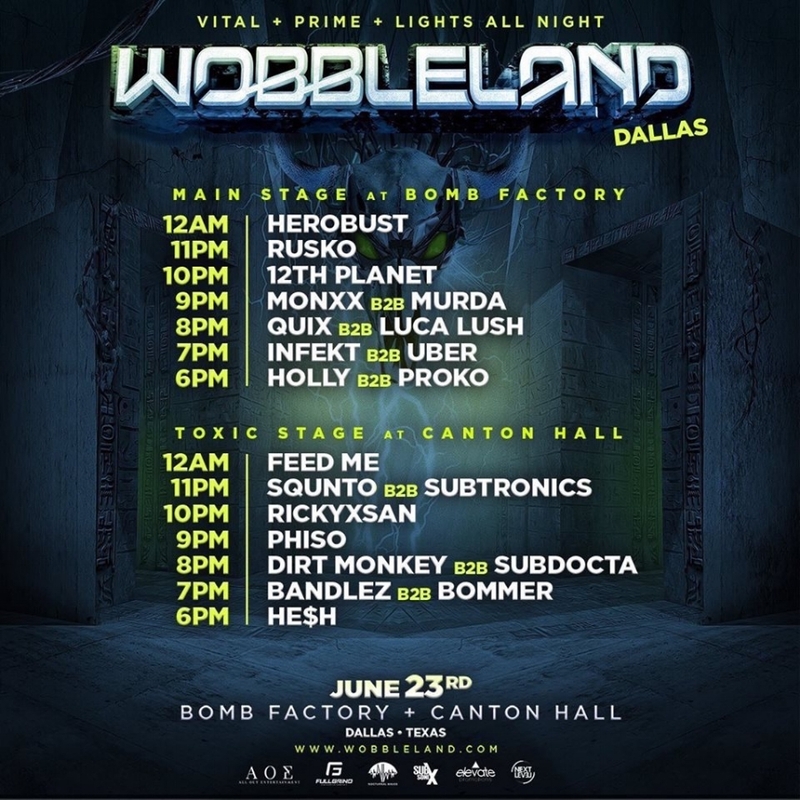 Saturday starts early and ends late as Wobbleland tears up The Bomb Factory and the newly-opened Canton Hall. Starting at 6 pm, both venues will be booming until 1 am with the biggest names in bass music. The team at Vital, Lights All Night and PRIME wanted to make things easy for all the fans so they even added an indoor walkway inside the two venues for easy access to both stages! There are very limited amounts of General Admission tickets remaining so DO NOT WAIT to purchase at the door! This will sell out! After destroying your ears at Wobbleland, make your way down Commerce St. to the official Afterparty happening at RBC. Pack yourselves into the intimate venue for more dub and wubs. Monxx and Quix will be headlining the event with HE$H and Masked & Freed as special guests. trust us when we say that you do not want to miss this one. This weekend is sure to be one for the Richter scale as Dallas makes another mark on the bass music industry. With tickets nearing sellout, this is a weekend you do not want to miss out on. Who are the sets you are most excited for? Who do you think will be at the afterparty? Comment below with your answers and we will see you out there headbanging and breaking rails.